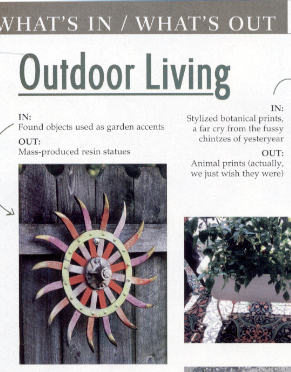 The other day, in my excitement about having a couple gardens in Buffalo Spree's HOME magazine, I didn't even notice that a third garden, the garden of Laurie Counihan Brown was also used in the magazine. You can read the entire article here. 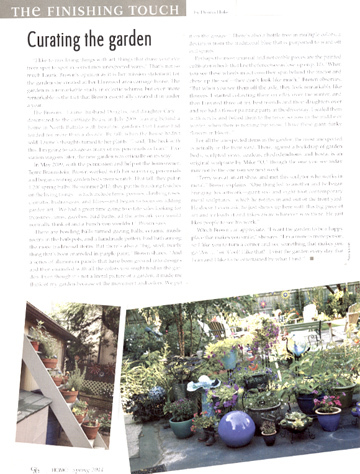 It's called "Curating the Garden" and was on the last page of the magazine under the section title, "The Finishing Touch." 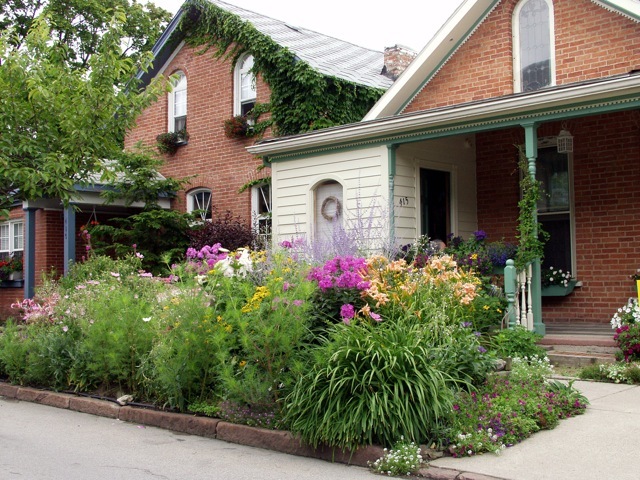 Laurie's garden, the first ever Garden Walk garden on Lincoln Parkway, is quite the garden. The pictures in HOME don't really do it justice. I stopped by last year before the Walk and got a tour around. It's an immense carriage house (as you would imagine behind a home on Lincoln Parkway) across from the Delaware Park Rose Garden. "flower garden" along a stretch of fence. 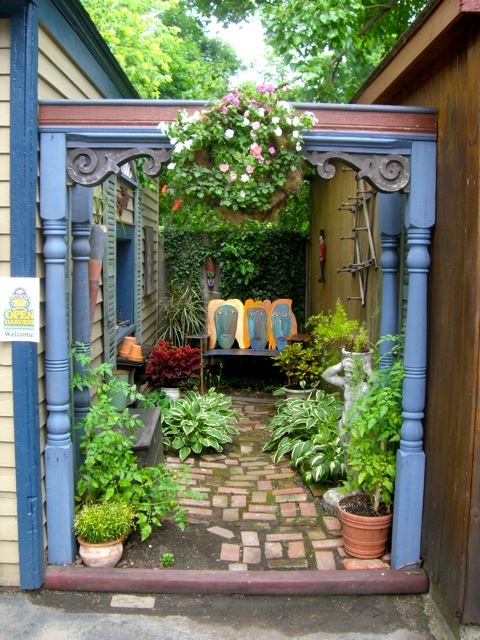 If there ever were a garden I'd throw into the Buffalo-style garden column, this would be it – it is filled with color, found art, and art from re-purposed materials – though it's WAY larger than most city garden plots. Since the property is not theirs, it belongs to the owners of the main house, whatever had not been planted in the ground went into a huge assortment of pots. Even some of the pots were of items not originally intended for pots – like hardware-store ceramic chimney pipes as planters/pedestals. The front of the main house had immense plantings on the columns and an original large outdoor sculpture. A local scultor uses the space (with permission!) to showcase his large-format, metal works. He changes it up every once in a while – they can wake up in the morning and there will be a new sculpture adorning the front of the house. Being next door to the Albright-Knox, it gives the feel of the art spilling out into the neighborhood. I wish a sculptor would adopt my yard. I think what blew me away also was the fact that she'd only been there a year or so and the garden looked so established. Maybe the large number of pots helped give that impression. I remember there being some nasturtiums so large they trailed up an arbor. There were dozens of ideas in this garden – and I didn't have my camera. I'll have to go back this summer and get some shots. I have not seen every garden on Garden Walk (there were 355 gardens last year!) but I've probably seen more than just about anyone. I tell you some of the jewels of the Walk are gardens that may not be in the clusters of dots on the map. 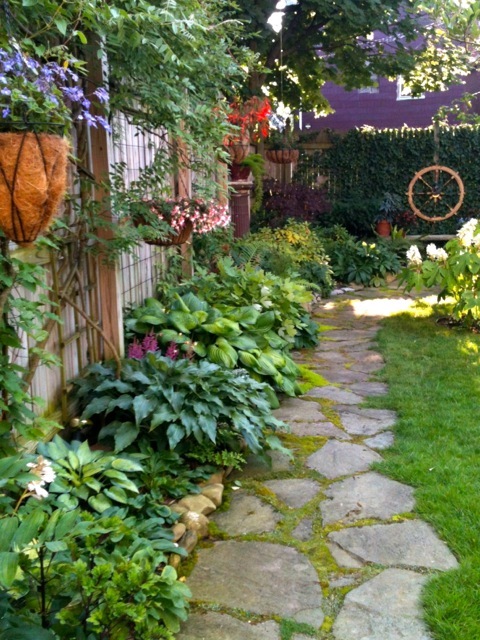 There are plenty of great gardens worthy of a visit away from the very popular areas. If you're looking to drop by a garden or few that you've not seen before, a visit here and a quick walk through the Rose Garden is a worthy endeavor.